From Oliver Jeffers and typographical fine artist, Sam Winston, comes an inspiring and lyrical picture book about a little girl who sails her raft ‘across a sea of words’ to arrive at the house of a small boy. There she invites him to come away with her on an adventure where they can journey through ‘forests of fairy tales’, ‘across mountains of make-believe’ and ‘sleep in clouds of song’. Guided by his new friend, the boy unlocks his imagination and a lifetime of magic lies ahead of him But who will be next? Oliver’s elegant art is combined with Sam’s astonishing typographical landscapes beautifully shaped from excerpts of children’s classics and lullabies to create a celebration of all that books can do and all that books can become, and to encourage readers of all ages to have an immersive and unforgettable reading experience that they will want to pass on to others. 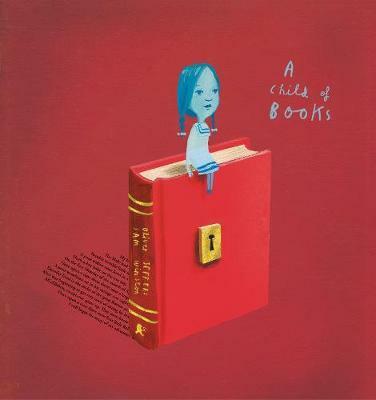 Oliver Jeffers and Sam Winston mellifluously and joyously invite us to celebrate The Book. The outcome of their collaboration is a gorgeous and sensitive exploration of how magical books are and how we should be inspiring children to not only encounter the classics but also to find their own narratives. A young girl entices a young boy to sail ‘across a sea of words’ with her because she is a ‘child of books and comes from a world of stories’. As they roam in and around gems of children’s literature and the eloquence of the written word merges with the dreamlike mastery of the images, the reader is borne away into a world of enchantment. This is a book for book-lovers and for anyone who wants to encourage a child to love books. So be inspired, bewitched and seduced by one of the masters of picture books in Jeffers and a newcomer to children’s illustration, Winston, who is surely on his way to a stellar career.